However, the Bible seems to have another idea. 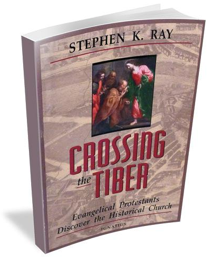 In my book CROSSING THE TIBER I mention a few passages from Scripture to give a more biblical perspective. “One last comment, even though it will be discussed in more detail later: there is no attempt here to pit baptism against faith, or belief against baptism. Things are rarely that simple. Faith and baptism are two sides of the same coin. Are we saved by faith or by baptism? Are we saved by believing or by the Spirit? These are false dichotomies that should have no place in our thinking. “How does one receive salvation, justification, new birth and eternal life? By repentance (Acts 2:38; 2 Pet 3:9)? By baptism (Jn 3:5; 1 Pet 3:21; Titus 3:5)? By declaring with our mouths (Lu 12:8; Rom 10:9)? By coming to a knowledge of the Truth (1 Tim 2:4; Heb 10:26)? By maintaining the faith (Col 1:22-23; Mt 24:13)? By works (John 5:28-29; Rom 2:6, 7; James 2:24)? “Can we cut any one of these out of the list and proclaim it alone as the means of salvation? Can we be saved without faith? without God?s grace? without repentance? without baptism? without the Spirit? These are all involved and necessary; not one of them can be dismissed as a means of obtaining eternal life. How are you i am malbert from goa india i have been for your conferences in pilar, i love and appreciate the way you teach and defend the catholic faith, but can you please tell me why do catholics kiss the statues of the saints is it not idol worship ????. i am an roman catholic but this question was asked to me by an believer friend who was an ex-catholic. thanks and god bless you always. My answer is late in coming. I hope that someone has addressed it directly to you. Anyway, we kiss the feet, hands and face of statues of our Saints for the some reason that I kiss the pictures of my mother, wife and children. Because we love them and the images are symbols of them whom we love. The Saints are members of our family. The family of God united in love for each other and for God. Therefore, there is nothing wrong in showing love towards them in anyway that we see fit. Nor is that showing of love in any way a form of adoration which is due only to God. It is simply our love for those who love God and have now been perfected in faith. STEVE RAY HERE, COMMENTING ON STEPHEN MENEZES’ COMMENT BELOW. IF I HAD A NICKEL FOR EVERYTIME SOMEONE POOR EX-CATHOLIC (MAKING AN ASSUMPTION HERE) HAS BEEN DELUDED BY WELL-MEANING FUNDAMENTALISTS POSTED OR SEND ME THE KIND OF DRIVEL BELOW, I’D BE A RICH MAN. ACTUALLY THE COMMENT IS PRETTY SAD. I SUSPECT HE USED THE LIST OF “INVENTIONS” INVENTED BY BOETTNER. I USED TO PROMOTE THIS KIND OF NONSENSE TO, IN MY FORMER LIFE AS AN ANTI-CATHOLIC. I LEAVE MENEZES’ COMMENTS FOR COMEDIC AND EDUCATIONAL PURPOSES. Faith only believer want Mark 16:16 to just go away. It will not go away, so they try to explain it away. Over 100 translations of the Bible include Mark 16:16, however, that does deter some faith only believers from insinuating or simply stating that Mark 16:16 should not be including in the Bible because it was missing from a couple of manuscripts. If you believe God has a hand in guiding men to translate the Bible correctly, then have to believe Mark 16:16 should be included. If you do not believe the Bible has been translated accurately, then I would suggest that you burn all of your Bibles. The most popular way of explaining away Mark 16:16 is to say that it does not say, that he who has not been baptized will be condemned, therefore water baptism is not essential to be saved. If a secular law were written as such: He who does not commit robbery and does not murder will not go to prison; but he who commits robbery will go to jail. Would that mean you can still murder and not go to jail; because it does not state murderers will go to jail? NOT MURDERING IS ESSENTIAL TO NOT GOING TO JAIL! Being baptized is essential to not being condemned. There have been many attempts to explain water baptism away from Mark 16:16, including denying that, and, is a conjunction linking belief and baptism. Many attempts at distorting the simple meaning of words and sentence structure are used. Grammatical distortions are used in order to make Mark 16:16 fit the “faith only” narrative. HAS BEEN BAPTIZED SHALL BE SAVED, STILL MEANS WATER BAPTISM IS ESSENTIAL FOR SALVATION NO MATTER HOW MEN TRY TO EXPLAIN IT AWAY. Evangelicals teach a Doctrine of Works Righteousness. Roman Catholics teach that Jesus alone saves you, but then the believer, the Christian, must do good works to complete or assist in his salvation. However, salvation itself was initially given without any merit of the sinner. In the Roman Catholic Church, any infant (who is a sinner by way of Original Sin) brought to them with the consent of the parents or guardians, will be baptized and receive God’s gift of salvation, even if the parents themselves are not believers. So what did this child do to merit salvation? Answer: he was breathing and present at the time and location that God chose to save him. That’s it. In Evangelical theology, the sinner must choose or decide that he wants to be saved. Now some evangelicals may nuance this position and state that this decision is only possible due to the work of the Holy Spirit creating faith in his heart, but bottom line, most evangelicals believe that the sinner must choose to believe. “We are not automatons or robots in the act of salvation: we have to choose to be saved!” they will say. So who did more work to be saved in these two theologies: the Catholic baby at the baptismal font or the evangelical adult or older child who used his maturity, his intellect, and his decision-making capabilities to make a decision as a prerequisite for God to save him? This is a very old message, but I thought I’d respond to it just for the practice. From a Roman Catholic perspective, the concept of saving faith is far removed from the biblical teaching of commitment to and simple trust in Christ alone for salvation. From a Roman Catholic perspective, saving faith is a result of a commitment to and simple trust in Christ and saving faith is described in Scripture as accompanied by works of love. The Roman Catholic Church has distorted the gospel of grace. The Catholic Church teaches the true Gospel of Grace. No one else does so. And that which you are teaching is a distortion of the Gospel of Jesus Christ. It has fallen into the same Galatian error of legalism (a sacerdotal/sacramental/works salvation) addressed by Paul in his letter to the Galatian Churches. On the contrary, St. Paul teaches a sacerdotal/sacramental system for the salvation of those, who in obedience to Christ, change their life and repent of sins, putting their faith to work by love. Its called, Catholicism. In that letter Paul dealt with the heresy of the Judaizers, who attempted to add the Jewish ceremonial law to faith in Christ as a basis for salvation. Temple worship and the ceremonial law included circumcision, an altar, daily sacrifices, a laver of water, priests, a high priest, special priestly and high priestly vestments and robes, candles, incense and shewbread. In the routine religious life of the average Jew there were feast days, prayers, fasts, adherence to the tradition of the elders and certain dietary restrictions. All of these things were included in the Judaizers’ teaching on salvation. So it was Jesus plus the Jewish system. How does this relate to Roman Catholicism? Judaism is the precursor of Catholicism. Jesus Christ was born a Jew. He established the Catholic Church, fulfilled and brought Judaism to a close and commanded His Body, the Catholic Church to preach His Word to the world. The doctrines of salvation embraced by Rome are, in principle, identical to the Judaizers. I’d have to agree. As long as we remember the qualifer, “in principle”. and until recently adherence to certain dietary regulations). Not so. Abstinence is a form of fasting and Jesus Christ commanded it. Catholicism teaches that all foods are clean. By Judaizers, I think you’re referring to the Jews who converted to Catholicism in Apostolic times. It is true that they, at first, thought that the Mosaic law would continue. However, they were corrected, by the Apostles and it is recorded in Acts 15, the Jerusalem Council. I’ve shown where most of that is commanded by Jesus Christ in the New Testament. The ones which I didn’t address are these. 2. Circumcision – Circumcision was replaced by Baptism. 9. Laver of Water – Laver of water means washing or Baptism. But the OT laver was not effective. Whereas, the Christian laver is the means of regeneration by the Holy Spirit. 11. Candles – we will find candles, even in heaven. Although you used slightly different terminology, here, I’m pretty sure that anyone can see that I have already traced them to the Bible, above. Moses designed His system in accordance with that of Christ’s (i.e. the heavenly things to come). The Roman Catholic teaching on salvation is essentially the same as that preached by the Judaizers. True. As we can see in Heb 11, the Jews themselves were saved according to their faith, which they demonstrated by their works. Read the entire chapter. Paul warned the Galatian believers that if they embraced this false gospel they would actually desert Christ (Gal. 1:6). He warned them that if they went back to Judaism, which had been replaced by Christianity, they would desert Christ. You’re digging your own grave. Jesus Christ speaks through the Catholic Church. The Catholic Church is the Body of Christ. If you reject the Catholic Church, you reject Christ in so doing. Going out of one’s way to represent Catholic sacraments, abstinence, and fasting as Pharisaic Jewish heresies is quite amusing, indeed, Steve. Talk to a present-day Orthodox Jew, and I think one will find that that’s the LAST thing they think of us, what with us not obeying or even knowing the 613 mitzvot. What’s infinitely more amusing is what evangelical Protestants imply with their nonsense, which is that THEIR faith, which contains no sacraments nor a real teaching hierarchy, is the true faith of Sts. Peter and Paul. Going back to the subject of Judaism, I would like to gently correct my friend in the faith De Maria about something: it would be better for the sake of avoiding confusion to refer to the old faith of Abraham, Isaac, Jacob, Moses, and David as Hebraism or Israelism. Our Catholic Christian faith can much more credibly be called the continuation of the faith of the Old Covenant than the spiritually corrupt faith of the modern-day Jews. That latter faith, Judaism – the religion founded by the rabbinical Pharisees after the Fall of Jerusalem in 70 – was developed as a reactionary system whose sole purpose was to justify the denial of Jesus Christ as the Messiah. Thanks for your correction. But I think you’ve misunderstood Stephen Menezes’ comment. He wasn’t comparing Catholicism to OT Jews, but to a Christian sect which some people call “Judaizers”. That term is not found in Scripture. But St. Paul, frequently complained about a group he called, “the Circumcision”. In one of his more stringent objections against them, he actually said, I wish they would “cut it all the way off!” (According to some translations). Galatians 5:12 (NAB) Would that those who are upsetting you might also castrate themselves! Essentially, Menezes is saying that Catholicism follows that heresy (the one which requires circumcision and continued submitting to Mosaic law). That is an objection commonly voiced by Protestants because in the same Epistle, St. Paul also confronted St. Peter and called him the “Apostle to the Circumcision”. Note v 8 and v 12 in the following excerpt. 9 And when James, Cephas, and John, who seemed to be pillars, perceived the grace that was given unto me, they gave to me and Barnabas the right hands of fellowship; that we should go unto the heathen, and they unto the circumcision. 10 Only they would that we should remember the poor; the same which I also was forward to do. 11 But when Peter was come to Antioch, I withstood him to the face, because he was to be blamed. There is a group in Latin America which calls themselves, Messianic Judaism. And they follow this line of thinking. Claiming that the Catholic Church is the Church of Peter and their group is the Church of Paul. I suspect that Menezes is a member of this group. Next post: Amazing Petra: World Heritage Site of Stunning Beauty – Full Tour!